Special Container Gardening Savings Just for Tomato Dirt Readers! We love to save money - don't you? Get the best selection and lowest price for garden containers and pots at My Pots and Planters. Plus, as a Tomato Dirt reader, you get an extra 5% off when you click here or use the code SHARE5. AND … get free Shipping on almost everything + easy returns. Browse, order, and save now! Growing tomatoes in containers successfully has a lot to do with preparation and making good choices ahead of time. 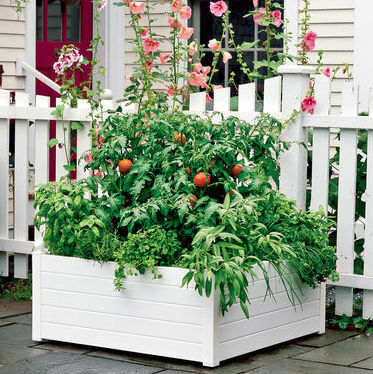 Before you get starting planting tomatoes in pots – as you're thinking about and planning your container tomatoes – you can take steps to make sure your container gardening is as healthy as possible. Choose the largest container possible. The more space your tomato has to grow in, the healthier it will be. Choose varieties specifically for containers. 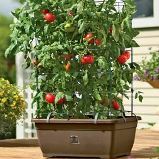 The best types of tomatoes to grow in containers are bush varieties, dwarf varieties, short-season varieties, and determinate varieties – for obvious reasons: they don’t get as big as other types of tomatoes, they mature faster, and they finish growing at a certain point in the season. 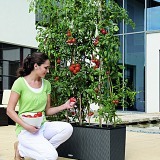 Choose a healthy potting mix Tomatoes grown in containers need a loose, well-drained soil with lots of organic matter. Choose a sunny spot. Tomatoes need at least 6-8 hours of full sun a day. Choose easy access to a water source. Whether you set your tomato pots near your garden hose or you have a convenient way to water them with a pitcher or watering can, make sure you have easy access to a water source. You will use it! 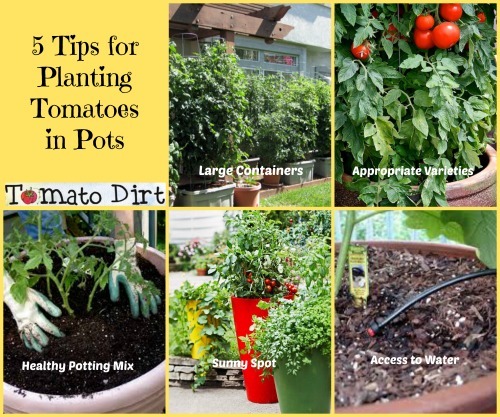 Find out more tips for getting ready for planting tomatoes in pots.And be sure to check out our Container Tomatoes board on Pinterest for more tomato inspiration. Growing a Garden Should Be Easy - and Not Cost Much! It is! You can save money and grow veggies even if you have a small space or no space. Learn more with this terrific report and step-by-step guide. Click Here! 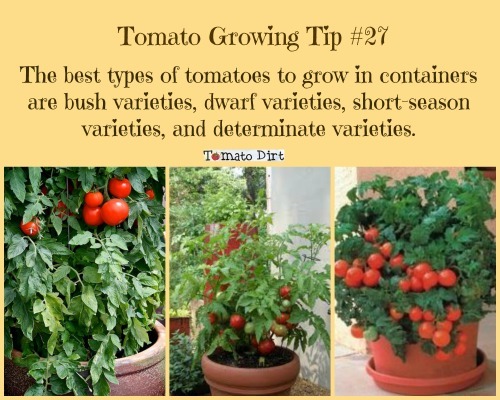 Tomato Growing Tip #27: What Tomato Varieties Should I Grow in Pots? What Potting Mix Should I Use for Growing Container Tomatoes?